Explanation: What's happening near the south pole of Jupiter? Recent images sent back by NASA's robotic Juno spacecraft are showing an interesting conglomeration of swirling clouds and what appear to be white ovals. Juno arrived at Jupiter in July and is being placed into a wide, looping orbit that will bring it near the gas giant -- and over its poles -- about twice a month. The featured image is a composite taken by JunoCam and post-processed by a digitally savvy citizen scientist. 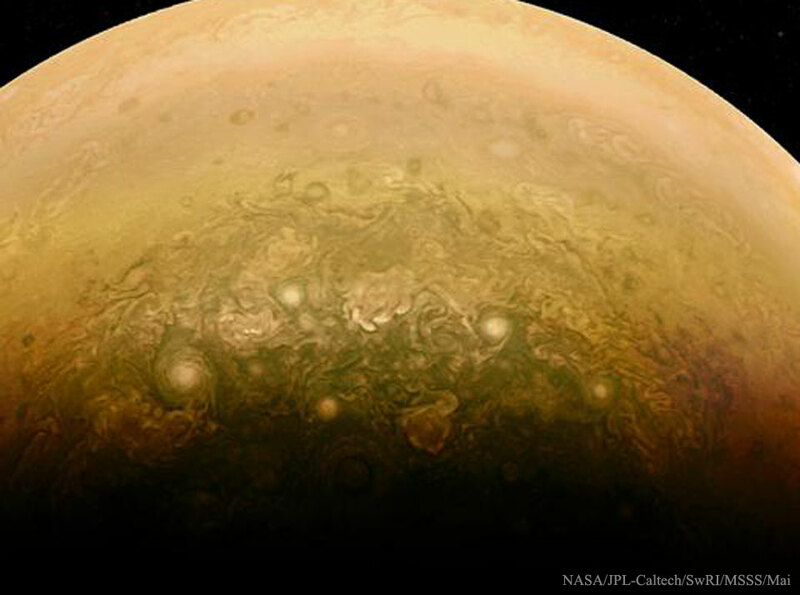 White ovals have been observed elsewhere on Jupiter and are thought to be giant storm systems. They have been observed to last for years, while typically showing Category 5 wind speeds of around 350 kilometers per hour. Unlike Earthly cyclones and hurricanes where high winds circle regions of low pressure, white ovals on Jupiter show rotational directions indicating that they are anticylones -- vortices centered on high pressure regions. Juno will continue to orbit Jupiter over thirty more times while recording optical, spectral, and gravitational data meant to help determine Jupiter's structure and evolution.